After the flawed Resistance 2, a game that drained the joy from the PlayStation 3's once very promising shooter series, Insomniac Games comes closer to hitting its target with its third game set amongst the human-Chimera war. All it took to get Resistance 3 back on track was a bullet in the head. Gone completely is former Resistance protagonist-turned-super soldier Nathan Hale, the man put down by Joe Capelli at the end of 2008's Resistance 2. Capelli's Resistance story is a post-apocalyptic Planes, Trains and Automobiles, inverted and with fewer laughs. Our hero leaves wife and child behind to take care of important hero business in New York City, attempting to destroy a Chimeran tower, close a big old space portal and stem the flow of alien invaders. By boat, by train, by VTOL, Capelli slogs through Chimera nests from Haven, Oklahoma to NYC, a one man resistance of his own. Resistance 3 is good when it plays to the strengths of developer Insomniac Games, who are expert at making video game guns—no matter how ludicrous they may be—feel somehow right. Resistance 3 is better when it evokes memories of revisiting Valve Software's Half-Life 2, particularly during a segment that's suspiciously close to that game's "We Don't Go To Ravenholm" levels—swap headcrab zombies for Chimeran Grims in a deserted town overseen by a group of god-fearing resistance fighters. The Half-Life 2 nostalgia carries through to the end of the game, as Capelli strives to destroy the gleaming monolithic tower that serves as hub for the Chimera. But maybe there are only so many ways to tell the tale of an alien infestation and the lone soldier capable of revolting against his oppressors. Insomniac doesn't spin that yarn from the first-person as capably as Valve did, however. Absorbing morsels of story through collected journals, audio tapes and dialogue from the hurried non-player characters of Resistance 3 is far clumsier, more obvious than what Valve was capable of. Resistance 3 is at its very best when you're juggling its array of weapons, pausing carefully to select the right tool for murdering some Chimera amid some impossible battle, cycling through the weapon wheel that has thankfully returned. Capelli ultimately has a dozen weapons at his disposal, a design choice that undoes the limited arsenal of Resistance 2, a choice out of sync with the trend of limiting players to but a handful of weapons. It's a staunchly old-fashioned design decision, for the better, like the one that relies on health packs to survive Resistance 3's gunfights. There's no slowly regenerating health here (until you unlock a cheat from the game's Rewards shop) as in every other game with a gun these days. It may seem redundant at this stage of reviewing Insomniac Games' body of work to say that the developer excels at weapon design, but the array of firearms of human and Chimeran creation are inventive enough to still warrant praise. They range from the standard and expected (the Rossmore shotgun, the shoot-through-walls Auger, the enemy-seeking Bullseye) to the bizarre, almost silly (the freezing Cryogun, the disgusting Mutator, a gun that causes enemies to bloat, vomit and burst). They are a delight to experiment with when one has the luxury. The depth of Resistance 3's firearms is further explored via an upgrade system that boosts the firepower and functionality of most of its arsenal. With the exception of Capelli's hefty sledgehammer, every weapon has the power to level up with use over time, adding, for example, an improved scope, concussive rounds or the ability to target multiple foes at once. Each weapon upgrade offers a noticeable tweak in feel and performance. And those differences in effectiveness are tangible, thanks to the feedback of Resistance 3's guns. Resistance 3's gun upgrade scheme and its crowded weapon wheel ultimately became something of a meta-game for me, in part due to ammunition conservation, in part to acquire a trophy that requires one to fully level up each weapon. I didn't get that trophy by the end of Resistance 3, but not for lack of careful management of my weapon usage or strategy. Fortunately, for obsessives like me who care about virtual accomplishments like getting a Wildfire to "Level 3," no matter how grueling, Resistance 3 indulges the player with a new game plus option in which your weapon upgrades carry over. 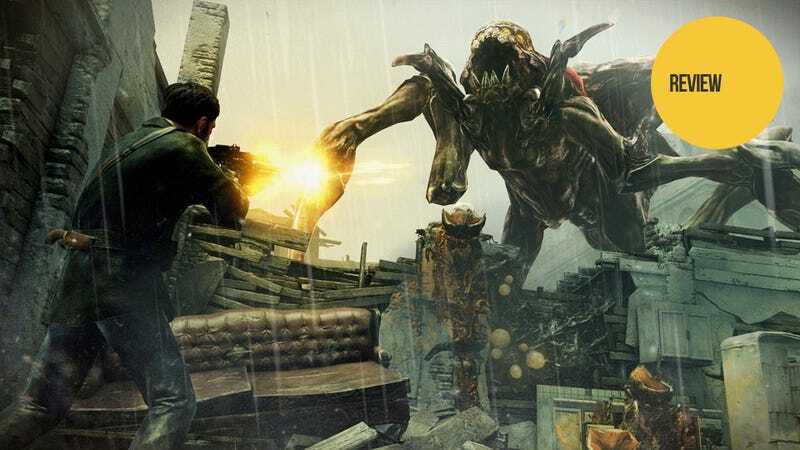 Where the PS3 game largely falls flat, unfortunately, is in immersing the player in an infested, dilapidated Earth or attaching any real emotional weight to its B-movie sci-fi plot. Insomniac starts strong, with touches of a beaten down community of ragtag survivors scraping by under Chimeran rule. There are details in this underground camp that resonate: residents sustaining themselves on canned goods, young children born into captivity in attempt to continue the human race, a man sleeping silently with his faithful dog at rest on his stomach. There's a quietude here that's later recalled during a memorable boat ride, an early stage of Capelli's quest; and later, when we can find ourselves sneaking through a Pennsylvania valley. Cloaked Chimeran snipers and dropships silently hunt for Capelli here, a welcome nighttime interruption from the battlefields. But Resistance 3's blundering AI and illogical action set-pieces often shatter the illusion of this devastated world. I've turned around in the midst of battle to see Chimera standing dumbly behind me, politely waiting their turn to be killed. I giggled during a chase sequence designed for action set-piece tension, but foiled by numbskulled bad guys who streamed like so much cannon fodder onto my train, lining themselves up considerately to be shot by the dozens. To be so forcibly thrust from the illusion that Capelli was ever in any danger or that humans and Chimera posed any threat certainly made it harder to invest in his struggle—or any emotional attachment to Mrs. and little Jack Capelli and his tiny mitten, Joe's only referenced memento. Fortunately, as simple video game first-person shooters go, the story is largely a success. Capelli travels from point A to point B by various means, with at least one unexpected course correction, to some degree of hasty satisfaction, if not total closure. Resistance 3's environments are often beautiful in their various forms of post-apocalyptic ugliness. The game buries too much of its story subtleties in collectible journals and audio recordings, leaving the first-time player with a surface level understanding of its narrative. What you'll get from Resistance 3's plot is what you'll put in (but who has the time to read someone's diary when there are Chimera to be killed?). Now, if you're still playing Resistance games, you're probably sinking substantial time in the game's ample multiplayer modes. These are great, if lacking in much originality. Resistance 3 borrows many of the bullet points of Call of Duty, Battlefield and Halo games past, ultimately resulting in a respectable suite of four to sixteen-player game types—Deathmatch, Team Deathmatch, Capture the Flag, Chain Reaction, etc. Gone is the 60-player maximum of Resistance 2 and its ambitious multiplayer cooperative mode, by the way. Co-op is limited to campaign and a party of two. Player progression is now-standard stuff, with the player required to grind for weapon and skill unlocks. There's a weapon and skill upgrade system on the multiplayer side too, but without the engrossing meta-game of weapon re-use and leveling up. There are perks and killstreaks and titles and XP and collectible ribbons. You know the drill. What Resistance 3 may lack in terms of multiplayer mode ingenuity and polish—there are some jarring frame rate and kill cam technical issues here—it makes up for in more outlandish player skills, like force fields, cloaking devices and x-ray vision, the benefits of designing around an original sci-fi universe. But credit to Insomniac for making the hopping into and out of multiplayer game types speedy and efficient with the option to jump into one the game's varied objective-based or deathmatch modes easily. Resistance 3 largely atones for the sins of its predecessor, an overly difficult, unbalanced and unhappy grind through an alien invasion without hope. It may not elevate the series beyond its current status also first-person also-ran but it's a step in the right direction. Here's to hoping that lessons learned here will make for a better future for this alternate past.